Truly, at times, it did resemble a roller derby. 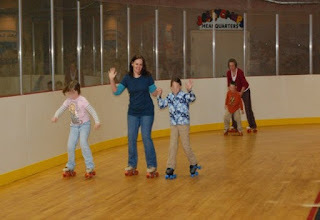 I think it's been at least 15 yrs, since I was on roller skates. I used to be pretty good, too, back in the day, but the balance and 'moves' came back very slowly (some, not at all). But, man, it was fun! It brought back so many memories... That's me in the blue. Oh no! hahaha. All I have to say is: Ace of Base. You can't go rollerskating without Ace of Base... and the limbo. The calves were feeling a little sore the next morning. Kind of sad really, seeing as I was only skating less than thirty minutes.